If you’ve been following us recently, you know our affection for Lake Cuyamaca State Park, and it was only a natural decision for us to go back and visit for a second time. As you may know, there are two campgrounds within the state park boundaries: Green Valley and Paso Picacho. This post is about our experience at Paso Picacho Campground, the larger of the two campgrounds within the park. Green Valley, the smaller, southernmost campground, is not reviewed in this post. You can see the review of Green Valley Here. Paso Picacho is a large campsite, with 85 sites spread out over 5 loops: Manzanita (C1), Live Oak (C2), Ceder (C3), Coulter (C4), and Cypress (C5). Two group campgrounds are also available, as well as day use parking, an RV dump station, a day use picnic area, and a Cal Fire Station. 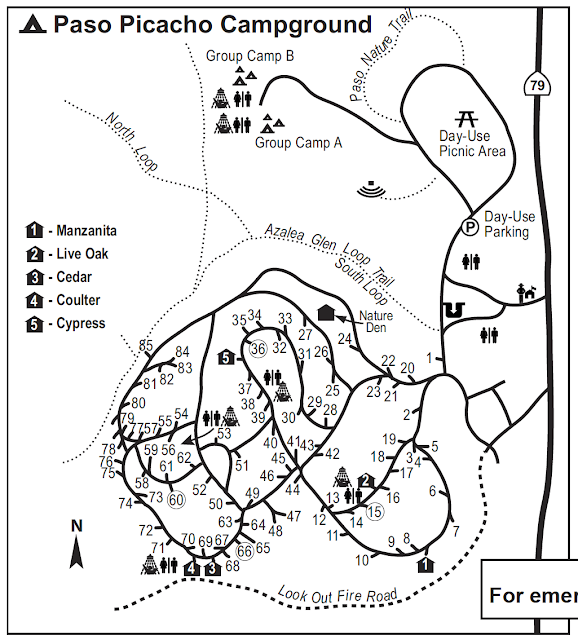 The day use parking area is designed to be used for hikers accessing the four main trails that leave the campground – 1) Azalea Glen Loop Trail, 2) Look Out Fire Road (to the top of Cuyamaca Peak), 3) Stonewall Peak Trail (more on that later), and 4) Cold Stream Trail (to the Visitor Center). Branching off of those main trails are ones that lead you south to the Green Valley Campground, east to the Los Vaqueros Group Horse Campground, and north to the Stonewall Mine. As you can imagine, the day use area gets packed during the summer, as Piso Picacho serves basically as the hub for excursions into the rest of the park, another reason in favor of camping here! If you’re not staying the night at either Piso Picacho or Green Valley, be prepared to fork over an $8 day use parking fee. Piso Picacho (as well as Green Valley) are open on the reservation system from spring to fall. Each campsite is equipped with a picnic table and fire ring, although for you RV folks there are no sites with hookups. Firewood can be purchased from the campground hosts for $8, who are located at at site 42 (the location and price may have changed since we last visited – if in doubt, ask a Ranger or explore the main campground road; the hosts are usually pretty easy to spot!). Any additional vehicles above the included one car are $8 apiece, with a usual limit of no more than 3 cars per campsite. Also, there is a limit of 8 people per campsite (keep reading for the good adjacent sites to book together if you have a larger group). If you’re bringing your dog, you’re in luck, they are allowed, but are only permitted to hang around the campgrounds, picnic areas, and paved roads (which includes the Cuyamaca Peak Fire Road). They cannot be left unattended. Food wise, the nearest store is a couple miles away North on State Route 79 in the actual town of Cuyamaca (by the lake), and is basically only a convenience store. It’s useful to stock up for a day of hiking (think chips, nuts, bars, waters ect.) but it won’t provide a very sustaining dinner. You have to drive all the way to Julian for an actual supermarket, and this is where we picked up our meat and sausages for dinner. The store is a family run business, so don’t drive out there at 10pm and expect it to be open. Alternatively, Julian has an abundance of great dining to choose from, including the famous apple pie shops (Julian Pie Company is our personal favorite, but I know many people who will defend Moms Pies to the death – either way you can’t go wrong). I’d recommend you stock up on snacks once in Julian so you don’t have to shuttle back and forth between your campsite and the town. It’s about 15 minutes to Julian from Piso Picacho. If you’re interested in checking out more of what Julian has to offer, check out the Julian Chamber of Commerce Page. 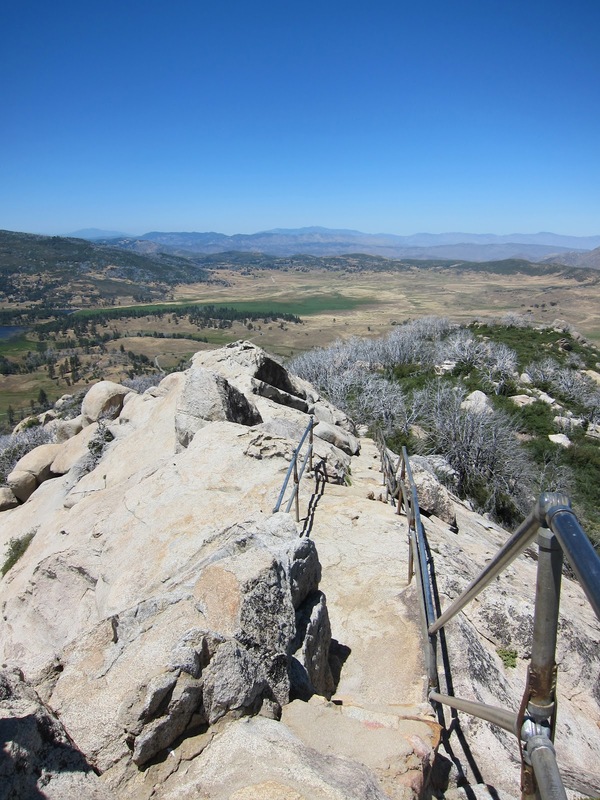 a nonprofit organization, the Cuyamaca Rancho State Park Interpretive Association. Our favorite sites at Piso Picacho are 9, 30, 40, 41, 49, and 58. If you’re going with a larger group, consider booking two adjacent sites such as 47 & 48 and 83 & 84. Remember, these are just our personal favorites: sites that have a good blend of shade, privacy, and usability. In our opinion, there is not one bad campsite there, but we would also try to avoid the sites right by the two trailheads within the campground: 78 and 85. Also, 13 & 71 are right next to the showers, while the Azalea Loop Trail passes right behind site 1. Piso Picacho is open on the reservation system from spring to fall, with reservations not required in the off months. If you do choose to come in the wintertime, be prepared for snow. Although rare, Piso Picacho does sit above 5,000 feet in elevation. Each campsite is equipped with a picnic table and fire ring, although for you RV folks there are no sites with hookups. Any additional vehicles above the included one car are $8 apiece, with a usual limit of no more than 2 cars per campsite. Also, there is a limit of 8 people per campsite. If you’re bringing your dog, you’re in luck as they are allowed, but are only permitted to hang around the campgrounds, picnic areas, and paved roads, and cannot be left unattended. There is a 14 day stay limit while in season (March-November), which expands to 30 days in the winter offseason. Seniors, you can get $2 off your campsite fee if you’re 62 and older, and 1/2 off with ADA (with vehicle placard or CA Parks ADA Access Card). Remember to check in if you come late! As with almost all sites, the gates reamin open after hours, you just have to make sure you come back in the morning to check in. Remember, Reserve America lists all of the Cuyamaca Campsites in one listing. MAKE SURE TO CHOOSE THE APPROPRIATE CAMPGROUND. Make sure the campsite starts with P0 (indicating Paso Picacho) and also includes the word “Paso” in the description. Something unique to Piso Picacho is the availability of cabins. As you can see on the map above, there are 5 cabins sprinkled throughout the campsite, with cabins 3 & 4 right next to one another. The names of the cabins are listed on the left side of the map, with their numbers corresponding to their location on the campsite loops. There’s also a ‘Nature Den’ cabin, a space rented out to different groups throughout the year. Often times, larger families will reserve the 3 & 4 cabins together, and cabin 1 is bordering the fire road without any shade. I have never stayed in a cabin like the ones at Cuyamaca, and predictably they’re extremely hard to get a reservation for, but if you’re sick of pitching a tent for the night, they’re a cool alternative to look into. Before you read any further and get excited about a future trip, please make sure you have a reservation made. In peak season, from April to October, reservations are needed weeks in advance, especially for the weekends. The proximity to San Diego, although great for travel time, is also your worst enemy – everyone knows about this park and this campsite, and most people who come once will come back. Also, Piso Picacho is a favorite of the San Diego college kids; SDSU, USD, and CUSD are all within short driving distance of the park. Although the Rangers are strict on noise, don’t be surprised if you’re kept up late at night if you’re staying over the weekend. On a different note – if you’re weary about returning to Cuyamaca after the Cedar Fire, don’t be. Although the fire ravaged the park, the fire crews were miraculously able to save the campsite itself, and all of the original trees within the campsite were saved. Save one or two sites in the Manzanita loop, all campsites are mostly shaded underneath the trees. In the picture above, you can see the difference. The grove of trees to the right is the campground, while all of the trees behind it leading up to Cuyamaca Peak were charred. Although the forrest of 10 years ago is gone, there is plentiful new growth as a new ecosystem is emerging and thriving. Just bring a little extra sunscreen and a hat, as most trails lack shade. Admiring the view south, looking towards the Visitor Center and Green Valley Campground from Stonewall Peak Trail. Vegetation has filled in nicely, but you can also see the grey skeletons of many roasted trees still adorning the hillsides throughout the park. Below, the steps leading up to the peak and the trail with Stonewall in the background. 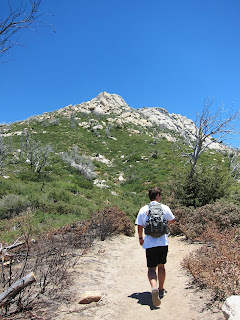 If you read our last review of the Green Valley Campground at Lake Cuyamaca, we did the second most popular hike in the park up Cuyamaca Peak (taking the fire road of the same name). 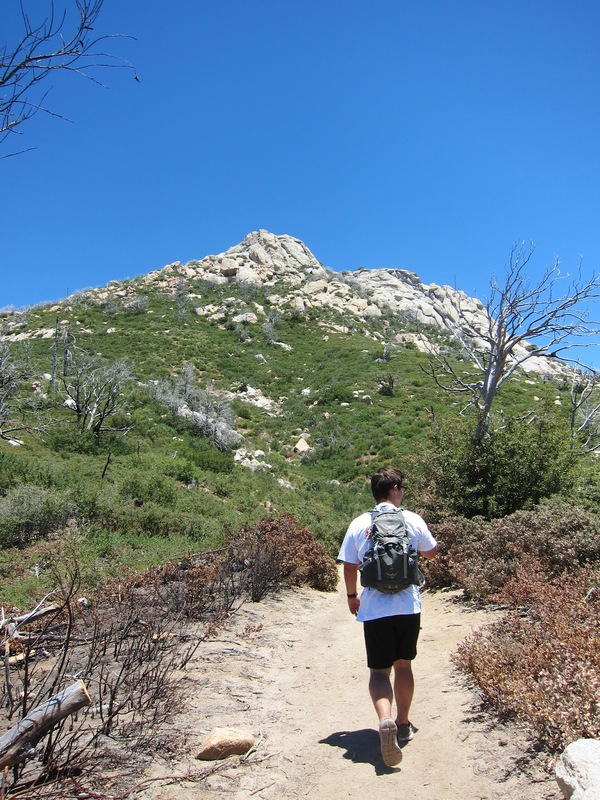 This time around, we did the most popular: the 2 mile trail to the top of Stonewall Peak. The trail was well marked, smooth, and although at a constant climb, was never strenous. The view at the top was one that rivaled the one from Cuyamaca Peak, and large swaths of sunbathed rocks were perfect for our lunch as well as sunbathing/napping. The view north from the very top of Stonewall Peak. On the left, Highway 79 snakes down from Piso Picacho and winds around the lake and the small village of Cuyamaca on its way to Julian. Overall, we really enjoyed our weekend at Piso Picacho, even more so than our stay at Green Valley. 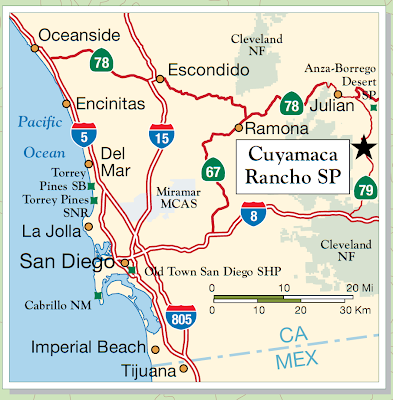 You can’t go wrong with either site at Rancho Cuyamaca, as each campground has its distinct advantages. However, considering the shortened driving distance to Julian, the access to the trailheads of the two most popular hikes in the entire park, the relatively short 10 minute drive to the falls at Green Valley, and the beautiful shaded campsites, we would have to give the edge to Piso Picacho. Of course, all of those advantages mean that you will have more competition to get a campsite, so make sure to plan ahead and reserve a spot, especially during the peak season and weekends. Make reservations by calling (760)765-3020 or visiting Reserve America, while inquiries to the Park can be sent to cuyamaca@parks.ca.gov. Let us know about your stay or ask us a question in the comments! Nice post and very well described. It looks a little too crowded for my liking though. How far apart are the sites? I tend to like more remote primitive backpacking trails. Thanks for the info. Hey Gary – if you’re used to backpacking or more remote sites, you’re going to feel a tad out of place here. Like most State/National Parks, more campsites = more revenue, so not only is it a big campground but personal privacy was likely not the driving design principal. 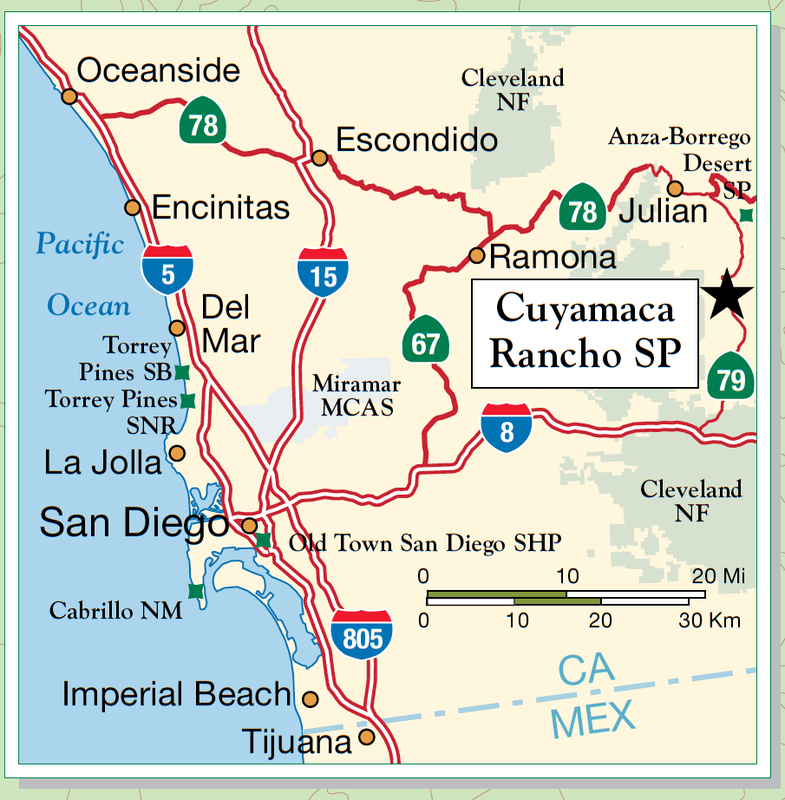 Keep in mind too that Cuyamaca is a really popular destination for families and college kids. That being said, there are a handful of sites that are more private, and it’s definitely a more secluded layout than other campgrounds in the State Park system. I would recommend looking at Green Valley as well, those sites are a little more private overall and the big rocks scattered throughout help too. I would call in and see the state of the creek at Green Valley, if it’s dry there’s a chance that campground maybe be a more vacant. Have a great trip and let me know what you find! Our pleasure! Hope you had a great trip, we’re itching to go back soon ourselves! thanks for all the good infor,we stayed at paso in august and had a great time and are going back next week. thanks for the advice about the spots to pick.